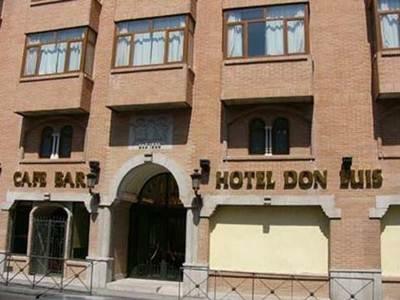 ﻿ Hotel Don Luis Madrid. JIMAT di Agoda.com! Bagi para pelawat yang ingin menikmati sepenuhnya pengalaman di Madrid, Hotel Don Luis merupakan pilihan tepat. Dari sini, tetamu boleh menikmati akses mudah kepada semua yang bandar meriah ini boleh tawarkan. Tidak kurang hebat adalah akses mudah hotel untuk ke pelbagai daya tarikan dan mercu tanda bandar, seperti Lapangan Terbang Barajas - Madrid, Kelab Golf Olivar de la Hinojosa, Parque de Juan Carlos I. Hotel Don Luis juga menawarkan banyak kemudahan untuk memperkayakan penginapan anda di Madrid. Hotel ini menawarkan pelbagai kemudahan di lokasi untuk memuaskan hati tetamu termasuk yang arif. Semua bilik tetamu menawarkan pelbagai jenis tahap keselesaan. Banyak bilik turut menyediakan bilik tidak merokok, pendingin hawa, pemanas, meja, bar mini untuk memuaskan hati tetamu. Di samping itu, pihak hotel menawarkan aktiviti rekreasi untuk memastikan anda mempunyai perkara untuk dilakukan sepanjang penginapan anda. Hotel Don Luis merupakan tempat yang ideal bagi penginapan pelancong yang mencari keindahan, keselesaan dan kemudahan di Madrid. Can not find uber / taxi , only using bus, need to walk around 5-10min to the bus stop. The wifi only in the lobby. The room is big. hola . overall good service and location . - Hafiz , Brunei Darussalam , South East Asia. I do recommend Hotel Don Luis. Front Desk worker, Cristina, was very helpful and wonderful. My only concern is that the hotel is about 500 meters from public transportation. With heavy luggage, this might be a problem for some. Uber costs 7.80 Euros to the airport. Location is good as it is close to airport but hotel is a bit old. Since I stay there in december, it is so windy outside and a bit noisy but I still think it is a good choice for short stay if you need to get to the airport early the next day since the location is really good. reception was very friendly. room was a bit cold and had thin blankets but i had a sleeping bag so i used it. one stop away from terminal 4. but quite a walk to the station. wouldnt mind staying there again. very clean. good located. staff no very friendly. Best value hotel near the airport. It's a 15 minute walk to Terminals 1/2/3. Rooms are big, comfortable and clean. Only downsides: no WiFi in the rooms and the thermostat does little more than to control the fan speed. Heating was a bit excessive even with the thermostat turned off, so we had to keep the window open during the night to cool the room a bit. Other people may find the temperature pleasant. No complaints at all, the hotel was right by the airport, great, simple, clean, and the friendly staff let us check in at 1 am! 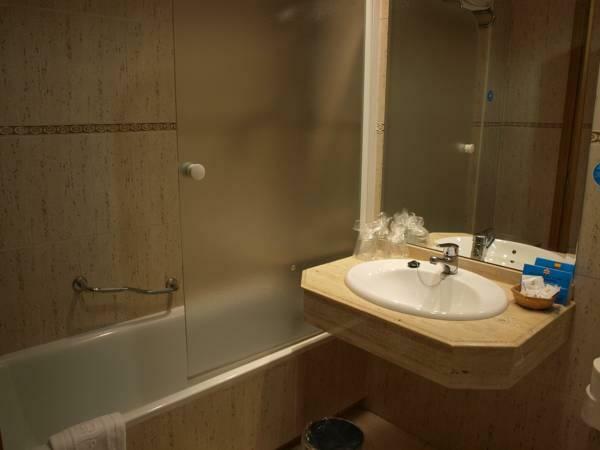 Clean, confortable, close to the Barajas airport, polite and helpful staff. I stayed over night, 2 times in 12 days in this hotel, with a friend. Both our stays were really enjoyable, the rooms we were in were clean, beds were confortable to sleep in, staff was very helpful about transport and other questions we had about Madrid, so I would recommend this hotel to anybody who is staying in Madrid (since it is close to the metro and bus station), especially if they have connecting flights. Good. Easy access to the metro and then to the city center and airport. Ideal for business people. The hotel is walking distance from the Barajas metro station. Hotel is near to airport. Note that the taxis charge 20 euros from airport to hotel, very expensive. Staff were helpful and courteous. Room was very good. it is very nice hotel and kind service..
nice and clean room spanish type...nice smile good service. About 6,5 km from the Airport, nice rooms reazonable price and good service. breakfast which was included in the price was a bit prepackaged. a fresh croissant would have gone down well. very good kind receptions and nice clean room and quite close to the airport.